Princeton Mayor Liz Lempert and several members of the Princeton Council expressed serious reservations last week about a new plan from the New Jersey Department of Transportation (NJDOT) to make alterations to Route 1 just south of Princeton. The new plan would close jughandles connecting Route 1 to Alexander Road South and Harrison Street, and make a new configuration including adding extra lanes and installing new jughandles. The estimated cost is $40 million. 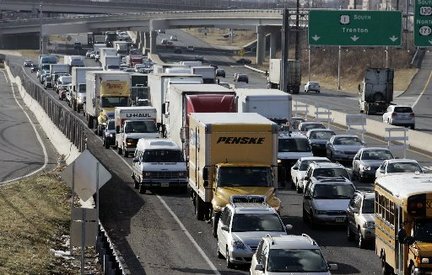 NJDOT are seeking urgent input on this plan, after their previous experiment at altering the road layout on Route 1 last fall ended with widespread local protest. Traffic along Route 1 near Princeton is undeniably terrible. But is it possible to make traffic flow better by adding new lanes and tweaking junctions? It has been recognized for some time that following road widening projects, improved traffic flow can be short-lived, as new cars enter the system to fill up any available space on roads. This ‘induced demand’ results in a never-ending cycle of road building, followed by increased cars, leading to more road building. Meanwhile, fields and farmland are paved over to create new traffic lanes and jug-handles. Roads usually stay built after they are constructed, (even when they are full of pot-holes!) so paved fields are lost forever, reducing green spaces and increasing impervious surfaces that put pressure on watersheds. How can we reduce traffic around Princeton without continually widening roads? We could force people out of their cars, by charging tolls or taxes for road use. But perhaps a better long-term solution is to remove barriers to people living near their places of work and stores, so that fewer journeys require the use of a car. This means allowing more people to live near where stores and jobs are. In Princeton this means allowing more homes near the downtown area. There is already a lack of housing in downtown Princeton, which is forcing people to live in surrounding areas like Montgomery township, Plainsboro and Lawrence. Traffic from people commuting into Princeton to work and play is a significant cause of regional congestion. If more people could live closer to town, we could take many cars off the road. There is not a huge amount of undeveloped land around Princeton for potential car-lite local residents to live. Unfortunately, the few remaining acres are often subject to highly restrictive zoning regulations that make it hard to add many new homes there. Walkable Princeton has a goal of promoting walkable, downtown living. This will allow people to ‘live locally’ and reduce oil use and traffic. We believe that the alternative-ever increasing traffic and sprawl-is both undesirable and unsustainable. This entry was posted in Local, Princeton, Sustainability, Traffic, Transit. Bookmark the permalink.